Billed as the most unpredictable election of modern times, it certainly produced an unpredictable result. The results were expected around the negotiating table, not the ballot box. In the end the voters returned the first Conservative majority in two decades. Itâ€™s a slim majority, but functional. The largest transfer of wealth to the privileged few, sorry, the long-term economic plan, can continue. Indeed, no longer encumbered by the Liberal Democrats, it can be accelerated. I want to talk about how the pollsters got it wrong, how the media and Conservative party spread fear throughout the electorate, how Labourâ€™s message failed, how just under 2/3rds of the electorate didnâ€™t vote for the party that won a majority. I want to talk about this, but right now I canâ€™t find the energy. Thereâ€™s so much hurt and thereâ€™s more to come. A close friendâ€™s disabled father burst into tears when he saw the news. On social media Iâ€™ve seen people publicly worry about how they are going to pay the bills over the next five years - and these are people in full-time employment. Iâ€™ve witnessed family members struggle to get the help they were entitled to, after they suffered from severe medical conditions. Iâ€™ve seen those entitlements rolled back. Youâ€™re only one step away from this: one accident, one genetic timebomb. Weâ€™re in for a tough five years. Elections are games; real life is not. Lives are at stake; your human rights are in the firing line. As I write this, there are protests on the streets of the capital. Politics isnâ€™t about turning up to the polling station and ticking a box every half-decade. Itâ€™s about standing up for your beliefs every day. This truly is the Darkest timeline. 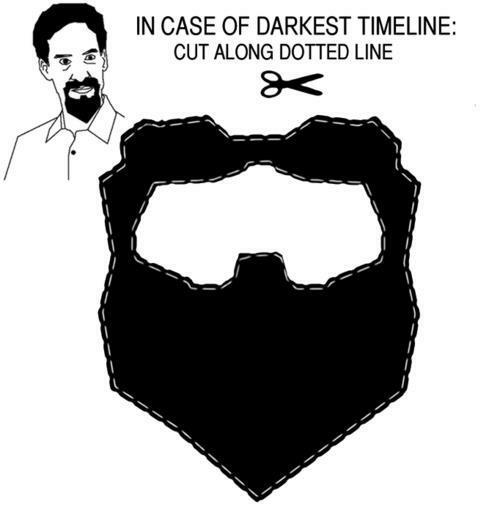 Print out your Evil Abed beard and hold your loved ones extra close tonight.